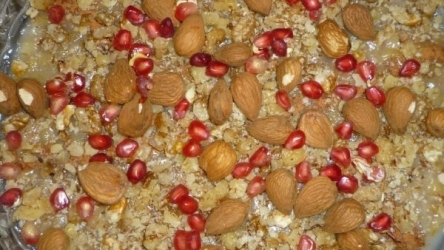 Anoushabour is an Armenian food recipe of New Year pudding with raisins and walnuts. Rinse wheat until it runs clear. Drain. Add wheat to cold water and bring to a boil, reduce heat, cover tightly and cook over lowest heat for 11⁄2 hours. Check the wheat at this point. All the water should be absorbed and the wheat soft. If dry and not yet cooked, sprinkle about 1⁄4 cup boiling water over wheat, cover, and cook for 10 minutes more. If any water remains, cover and cook another 5 minutes, or until absorbed. Mix in vanilla, walnuts, raisins, sugar, and salt. 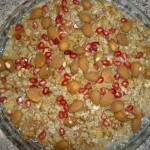 Transfer to a deep serving dish and sprinkle with nuts. Best served cold.